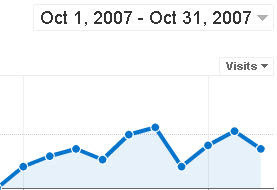 Google Web Analytics Guide: How to select date range in google analytics? I was able to choose a date range until the afternoon of 12/13, when the calendar began displaying up till 12/3/2007 (everything after that was grayed out). Even the dates that weren't grayed out I was unable to pick a range. I uninstalled and reinstalled the Flash player, to no avail. This is happening on both IE and Firefox. I would like to change the default opening date to as long as possible when I fire GA up. it is a great programme.